Their meeting occurs at the same moment students in Cuba (as well as Iran, Sudan, and Syria) have lost access to on-line classes offered by Coursera, a social entrepreneurship company which, as Al-Jazeera notes, offers MOOCs, or Massive Open Online Courses, to millions of students in over 180 countries. At the exact time President Obama shook hands with President Raúl Castro at the memorial service for Nelson Mandela, we were in Cuba – where word of the handshake circulated fast, and the reaction among Cubans was electric, even ecstatic. The President’s domestic political opposition felt quite differently. The six seconds Barack Obama spent grasping Raúl Castro’s hand infuriated them in sadly familiar ways. The rank opportunism of its fiercest critics seemed to knock the White House back on its heels. An Administration official said “this wasn’t a pre-planned encounter.” An earnest White House spokesman downplayed its significance explaining “they didn’t have a robust, substantive conversation about policies, but rather exchanged some pleasantries as the President was making his way to the podium.” Secretary Kerry said Obama “didn’t choose who’s” at the Mandela ceremony. Some reports spun the speech harder. The AFP said the speech contained a “clear swipe at states like Cuba.” Several pundits pointed to this sentence – “There are too many leaders who claim solidarity with Madiba’s struggle for freedom, but do not tolerate dissent from their own people” – saying those twenty-two words in Obama’s nineteen-hundred word address had been aimed squarely at Cuba’s government. There’s no reason to be defensive. The White House should be beaming with pride. As countless commentators have written, what passed between the two Presidents could have been modeled on Mandela himself. 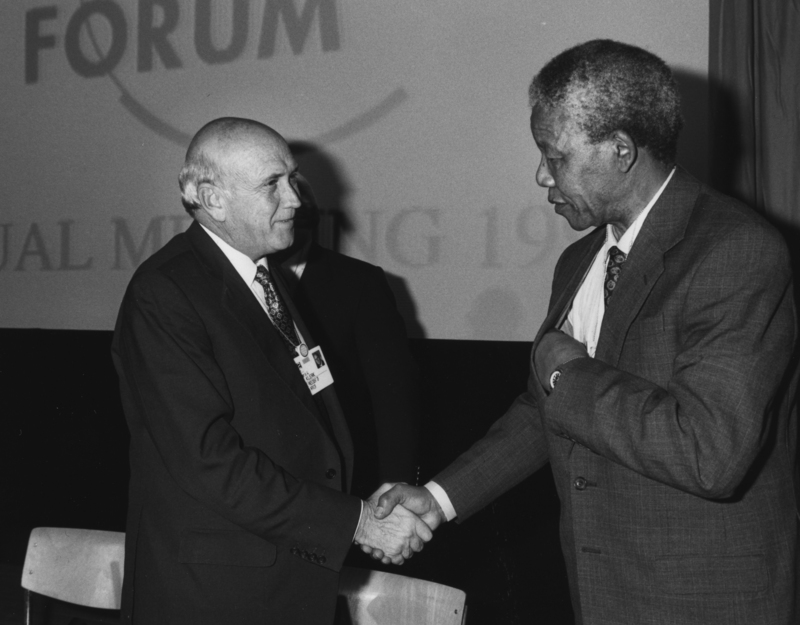 Nelson Mandela didn’t wring his hands over shaking hands with F.W. de Klerk, South Africa’s last apartheid president. He considered it essential to his goal of reconciliation for all of South Africa. He was photographed doing so time and again. Against the backdrop of history, the Obama-Castro handshake evoked a welcoming editorial reaction. Most of all, the White House should be heartened by the reactions of the Cuban people. Cubans who have lived their entire lives with the United States thumbing its nose at their country could not get over this small gesture of respect paid to their national leader by our national leader. This figure of political speech was vindicated by what we saw in Havana. It was as if the president had reached past Raúl Castro and personally shaken the hands of each one of the Cuban citizens we talked to. They were thrilled and empowered by what had transpired eight thousand miles away in South Africa. “Mandela taught us the power of action, but he also taught us the power of ideas; the importance of reason and arguments; the need to study not only those who you agree with, but also those who you don’t agree with. “And finally, Mandela understood the ties that bind the human spirit. There is a word in South Africa – Ubuntu – a word that captures Mandela’s greatest gift: his recognition that we are all bound together in ways that are invisible to the eye; that there is a oneness to humanity; that we achieve ourselves by sharing ourselves with others, and caring for those around us. So large, they felt his spirit in Havana. “Today, he has gone home. And we have lost one of the most influential, courageous, and profoundly good human beings that any of us will share time with on this Earth. He no longer belongs to us — he belongs to the ages. Nelson Mandela earned these beautiful words and even greater accolades long before President Obama was elected. But, the President’s comments were noteworthy because they were a sharp departure from how Mandela and the anti-apartheid movement he represented had been regarded by U.S. foreign policy. In what it considered to be Cold War battlefields, in places like South Africa and Angola, where the battles were actually being fought over colonization and racism, Washington drew a tough line. South Africa and its ally Cuba fell onto the other side. For decades, Mandela and his African National Congress were considered terrorists by the United States. This also worked to the convenience of the hardline anti-communist opponents of the Cuban government. Beginning in the early 1980s, Cuba was put on the State Sponsors of Terror List; punished, in part, for its intervention in southern Africa. This has done enduring damage to Cuba’s economy, with the sting of sanctions still being felt every day by Cubans and by international businesses engaged in commercial transactions with their government. At times, Washington’s Cold War preoccupation with Cuban troops in Angola led it in odd directions. One of President Reagan’s National Security Decision Directives, dated May 7, 1987, contemplated using U.S. information efforts “to undermine Cuba’s ability to deploy troops in Angola through specially focused radio programming broadcast to Cuba by Radio Martí,” which suggests that the National Security Council had no idea the signals were jammed and that no Cuban could be affected by propaganda they couldn’t hear. The same trip that brought Mandela to Cuba in 1991 also saw him come to the United States and brought him into contact with Americans who weren’t ready to canonize him. As he edged closer to the end of his life, cooler heads at least in Washington prevailed. In 2008, Congress passed, and President George W. Bush signed, legislation removing the African National Congress from the terrorist watch list. You can see the bill here. Its evidence of how the United States finally came to view Mandela not as a terrorist but as a global leader of unparalleled moral standing. Cuba was listed as a state sponsor of terror for reasons that included actions that Nelson Mandela believed led to his own freedom and the end of apartheid. The president could hardly offer a more fitting tribute than by removing Cuba from the terror list in Mandela’s memory and name. Whether it was retaliation by Cuba for a news ticker the U.S. Interests Section installed – later disconnected by the Obama administration – or caused by the island’s notoriously unruly power grid, the denial of electricity mattered. A principle was at stake. Governments don’t mess with other governments’ embassies. That’s a violation of international law. Fast forward to 2013 and to Washington, D.C., where the Cuban Interests Section is located. It’s suffering from a power shortage of a different sort, but the effect is equally pernicious. Due to the weight of U.S. sanctions and fines against financial institutions here and abroad, no commercial bank is presently willing to provide financial services to the mission, so that the Cuban diplomats can process the visas and travel documents that are required for travel. The cut-off of banking services to the Cuban Interests Section has been brewing for a long time. M&T Bank informed the Cubans in July of this year that it would no longer provide banking services to foreign missions. But it is, kindly put, an illusion to ascribe this simply to a business decision, as if the bank said it would no longer hand out decorative plates to customers who opened a passbook account. Since 2009, as Café Fuerte reports, more than $2 billion in fines have been imposed by the Obama administration for violations of the embargo in relation with financial transactions linked to Cuba, double the amount imposed under the Bush administration. No wonder banks are leery of dealing with Cuba’s diplomats. As enforcement actions have risen, another goal of the administration has been to increase travel by Cuban Americans and other U.S. residents, consistent with its “Reaching out to the Cuban People” strategy. According to the Miami Herald, its reforms enabled more than half-a-million visitors in 2012: “about 476,000 were Cuban Americans and Cuban residents of the United States” and another “98,000 (who) were registered as members of people-to-people programs” to visit Cuba. But, the administration must be confused; it cannot be the sheriff on one hand, making it so risky for commercial banks to engage in legal transactions with Cuba that its missions must shut down the issuance of visas and documents required for travel, while trying to prop open the door with its other hand so more family members and other U.S. travelers can visit the island. It has to choose. Armand García, president of Marazul Charters, says of Cuban-born travelers and U.S.-born travelers, “all of them need consular processing provided by the Consulate directly or through authorized travel agencies.” The government needs to get moving, or it could get ugly just in time for the travel rush for the upcoming holidays. The administration had better fix this problem or President Obama, who recently promised to be “creative,” and said “we have to continue to update our policies,” could be that man in 2013. He needs to encourage State to get the job done and fast. Honor the treaties. Find a bank. Ensure that the financial juice gets turned back on at the Cuban Interests Section as soon as possible. History need not repeat itself. And, of course, have a happy Thanksgiving! This week, five small business owners visiting Washington changed the conversation about Cuba to something deeper and far more interesting than what normally takes place when policymakers debate the future of Cuba and U.S. policy by themselves. Take, for example, Yamina Vicente, who taught economics to college students in Havana and left her post to open Decorazón, a business that provides decorations and hosts parties for Cuban families. Her clients spend as little as $20 and as much as $500 for birthdays, baby showers, weddings, and even the celebration of Halloween. When she was asked, “What does the ability to run a small business mean to you?”, her answer might have sounded familiar to anyone who has attended a Chamber of Commerce meeting in the United States. “There are five advantages,” she said. Yamina was joined by Nidialys Acosta and Julio Álvarez, whose fleet of rental cars allow tourists to see Cuba from seats inside restored Chevrolets from the 1950s; Niuris Higueras Martínez, owner of the fashionable Atelier paladar; and by Emilia Fernández, a human resources specialist in the state-run health system. Julio and Nidialys are earning more running their business than they did as employees of the state. They are learning more, as well, from foreign tourists who have advised them on everything from the amenities consumers expect (they now supply water and moist towelettes) to the design of their logo and website. Their business is taking off; with more reservations than they could handle, they expanded payroll and hired more staff, and they are now formalizing a contract approved by Cuba’s Tourism Ministry to provide their rental cars for use by foreign tourists in packages run by Cubanacan, a state enterprise. To Julio, who once stood outside the Hotel Nacional with his one taxi asking foreign tourists, “Do you need a taxi? Need a taxi? Taxi? Taxi?”, this is welcomed relief. Emilia Fernandez, whose hospital provides surgery for patients with retinitis pigmentosa and other eye diseases, sees opportunity with the reforms. Her institution can now access faster, more efficient maintenance and repair of its physical plant and stock its food service with fresher commodities because the state allows it to contract out to businesses run by self-employed workers. Moreover, she plans to research the health effects of the entrepreneurial economy – for example, stress – and to offer advice to the self-employed on how to maintain their health as they build their businesses. None of the Cubans declared their country’s private sector reforms had converted Cuba into an “entrepreneur’s paradise.” As in the U.S., the majority of small businesses in Cuba fail. They struggle due to lack of consumer demand, an inefficient system of allocating and obtaining credit, limits on their ability to buy wholesale goods, and limits on access to the Internet. These are problems native to Cuba’s system and cannot be fixed from the outside. By the same token, the changes they are reporting, such as their growth in personal satisfaction, are also rippling through the society at-large in ways with implications for U.S. policy. Earlier this year, Senator Marco Rubio ripped into visitors to Cuba, reminding them that the country (he has never visited) is not a zoo. Our Cuban visitors, however, said that tourism was driving the expansion of their businesses and was the source of innovation. They said Cubans are not only getting better pay, more jobs, and diverse services, but the private sector reforms are forcing the state enterprises to be more efficient and competitive. After listening to the cuentapropistas tell their stories, Carlos Saladrigas of The Cuba Study Group called the U.S. embargo, put into effect to change Cuba, an obstacle to the changes happening in Cuba. Lifting restrictions – encouraging more travel, opening the U.S. as an export market for goods created by the new Cuban businesses, allowing more support to flow from the U.S. into Cuba – is the right way to go if we want to support the transformation taking place. Niuris came to Washington with a promotional video for Atelier. Its theme – antes y después, before and after – records the reconstruction of her restaurant, but it could also be a metaphor for what is happening in Cuba, and a guide for where U.S. policy should go – from the embargo to something different and better for both countries. After more than a half-century of trying to get Cuba to fail, we should try listening to Cubans who want a chance for themselves and their country to succeed.